It is also important to ensure the client’s privacy by closing the curtains or the door to the room. Clean hands and clean equipment are essential to infection prevention and control when measuring vital signs. Ensuring cleanliness helps reduce communicable and infectious diseases, particularly nosocomial infections, which are infectious organisms acquired by a client while in hospital. Common infections include clostridium difficile (C. diff), vancomycin-resistant enterococcus (VRE), and methicillin-resistant staphylococcus aureus (MRSA). Ensuring your hands are clean is the best way to prevent and control infection. 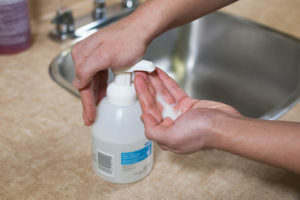 Hand hygiene can include cleansing with hand gel (see Figure 1.1) and hand washing. (see Figure 1.2). Use an alcohol-based sanitizer before and after contact with clients. Place gel on your hands and rub all hand surfaces for at least fifteen seconds. When washing hands using soap and water, wet your hands and apply soap. Rub all hand surfaces for about fifteen seconds, then rinse your hands. If the tap is not automatic, then turn it off with a paper towel. Hand gel is the preferred method of hand hygiene because it kills more bacteria and is easily accessible to healthcare providers. Soap and water is used when hands/gloves come into contact with bodily fluids. Healthcare providers always inspect equipment before use to ensure it is in good working condition. Equipment (e.g., stethoscopes, pulse oximeters) can be cleaned with alcohol-based solutions to disinfect the surfaces. Automated devices should be regularly serviced to ensure accuracy. Biomedical technicians/experts are responsible for preventative maintenance and calibration to optimize functioning. A pain assessment is conducted in conjunction with the measurement of vital signs because pain can influence the findings. Pain can activate the sympathetic nervous system and increase pulse, respiration, and blood pressure. Pain is a complex issue, and a comprehensive discussion of pain assessment is beyond the scope of this e-book. Briefly, because pain is subjective, self-reports are the most effective way to assess pain. The choice of pain assessment tool depends on the client situation: healthcare providers frequently use a numeric rating scale such as “rate your pain on a scale of 0 to 10 with zero being no pain and ten being the very worst pain that you have ever felt.” The response is often recorded on the vital sign record and expanded on in the narrative notes. Another common tool is the PQRSTU mneumonic in which each letter corresponds to a series of questions. The order of vital sign measurement is influenced by the client situation. Healthcare providers often place the pulse oximeter probe on a client while proceeding to take pulse, respiration, blood pressure, and temperature. However, in some situations this order is modified and the healthcare provider needs to critically assess the situation to prioritize the vital sign measurement order. For example, with newborns/infants, it is best to proceed from least invasive to most invasive, so it is best to begin with respiration, pulse, oxygen saturation, temperature and if required, blood pressure. In an emergency situation or if a person loses consciousness, it is best to begin with pulse and blood pressure. Generally, it is important to conduct a complete set of vital signs unless otherwise indicated. Determining the significance of vital sign measurements involves a process of diagnostic reasoning. The healthcare provider analyzes client data and makes decisions about whether the vital signs are normal or abnormal and whether the findings are significant: the following chapters provide normal vital sign ranges. The healthcare provider also considers agency policy, if applicable, about vital sign ranges to assess any abnormal variations and clinical significance. Additionally, the healthcare provider considers the client’s baseline vital signs to obtain a better sense of the client’s ‘normal’ and allow comparison (e.g., of trends) over time. The diagnostic reasoning process also involves considering other available objective and subjective data. Timely documentation of vital sign measurements is imperative as a form of communication, to observe trends in vital sign measurements, and to ensure effective intervention when needed. Documentation occurs on paper-based vital sign records or electronic systems depending on the agency. Healthcare providers follow the agency’s documentation policy and the professional standards of practice. If using a vital sign record, healthcare providers use the symbols noted on the legend of the record. General Points to Consider in Vital Sign Measurement by Ryerson University is licensed under a Creative Commons Attribution 4.0 International License, except where otherwise noted.